I thought I already had enough anger in my body at all the injustices done to women around the world, but while reading Mona Altahawy's Headscarves and Hymens: Why the Middle East Needs a Sexual Revolution, I discovered that at 5ft 2ins my body can hold a lot more rage than I thought. Eltahawy wrote an essay after being sexually assaulted in Tahrir Square while covering the Egyptian Revolution, an essay titled Why They Hate Us that ticked off quite a few people. Now, in this book, she expands on the topic of that essay, taking a deeper look at how the Middle East is largely home to societies built on sexism and misogyny, and how men use religion to control women's rights, women's minds and women's bodies. Headscarves and Hymens mixes the intensely personal - Eltahawy's experience of getting groped while on Hajj and her struggle with deciding to lose her virginity are among the stories included - with statistics and stories of women she has met. This is part autobiography, part investigative report, part call to arms. All come together to form a heartbreaking look at a group of people treated as second class citizens just because of their gender. I say heartbreaking, because there are stories in this book that made me shut my eyes after reading them, hoping that because I couldn't see the words on the page, the horror of what they described would go away. Of course it doesn't, and it shouldn't, and we should stop closing our eyes as a way of blocking out what's happening. Eltahawy's acknowledgement and exposure of this behaviour means that there is less likelihood of it happening in the future, or at least that when it does happen (and it will continue to happen for at least a while to come), we'll be less likely to brush it under the carpet or turn away. I feel, as a Muslim woman brought up to have and to exercise choice, that I owe it to the women in Eltahawy's book, who are so, so courageous, to read their stories and talk about them with other people. 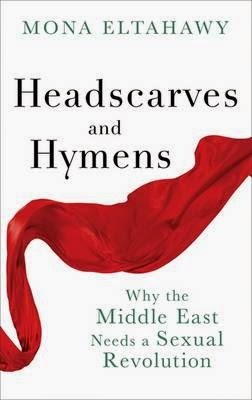 Headscarves and Hymens is an exceedingly brave book and one that should be taken to be the call to arms it is. Islam and gender politics is a minefield, but it takes one person to start a conversation, and to make people angry enough to do something about it. Eltahawy has started that conversation in a powerful way, and now it's up to me, as an angry reader, to make sure that I keep my eyes open and don't ignore what's happening. There are books that can change the world, and I believe and hope this can be one of them. •Headscarves and Hymens is released in the UK on May 21, 2015. How I got this book: From the publisher, Weidenfeld & Nicolson. This did not affect my view.